January | 2010 | Larval Subjects . 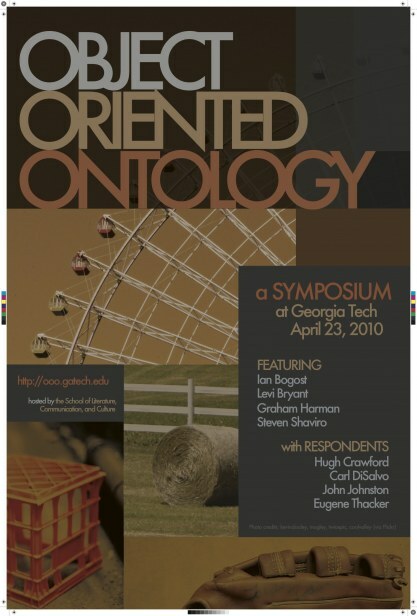 I’m pleased to announce the Object-Oriented Ontology Symposium hosted by Georgia Tech in April. You’ll find all the information here. Bogost has done a fantastic job designing the webpage. Come dressed as your favorite object, cyborg, troll, gray vampire, or minotaur! This announcement will be at the top of the page until April. New posts can be found directly beneath it. OOO is emerging, for me, as the correct metaphysical position. However, the dynamics of political, ecological, or economic situations seem to be (necessarily) relational in the sense you describe. The models of the different sciences (economics, biology) and even the “models” of the theological positions you describe might be closer to our notion of politics than a world full of objects. I say this even though I believe the world is full of objects. But are the relations real? I think that relational assemblages tend to constitute new objects. I still see discrete entities as real, not the flesh or the flux. At the risk of generating another bizarre blog war similar to the one Nick Srnicek encountered when he suggested that politics and ontology are distinct, here I think AMM is right to point out that ethics cannot be deduced from ontology. At most, ontology can serve a critical function with respect to ethical and political theories, examining the ontological presuppositions these theories make and revealing their untenability. This, for example, is what I’ve been trying to do with the concept of the human as it functions in Modernist ethical theories by calling into question the thesis that there’s any being or entity that corresponds to the human. Hat tip to Adrian Ivikhiv. Actor-Network Theorist John Law’s After Method: Mess in Social Sciences is now available for free through aaaarg.org. I’ve heard people gush about this book for a while but have never been able to bring myself to buy it due to its steep $188.00 sticker price and sadly I don’t have the best library. I’m thus extremely excited to see it made available online in this way. Check it out! Adrian Ivakhiv and I have been having a terrific exchange on objects and relations which really goes to the heart of what I’m trying to think about (here, here, and here). Indeed, in an earlier draft of The Democracy of Objects I had pitched the project of the work as working out “the relation between relata (objects) and relations”. As I read Adrian’s remarks, I get the sense that he worries that object-oriented ontology might lead us to ignore relations. After all, OOO begins from the premise that objects are absolutely independent of one another. This could certainly cause a lot of worries for an ecological theorist, where relations and systems are so important. I think this too quickly passes over, however, one of Harman’s most radical and original ontological claims; a claim that I have also made a center-piece of my own ontology. It is indeed the case that the ontological nominalist contingent of object-oriented ontology (Harman, Bogost, and myself), holds that objects are independent and autonomous with respect to one another. This is in contrast to the ontological relationist contingent (Whitehead, Latour), that holds that objects are constituted by their relations to everything else in the universe. However, this is not the whole story. One thesis that lies at the heart of the nominalistic variants of OOO pertains to mereology or part/whole relations. When I read remarks such as this, I’m inclined to wonder what assumptions the person is making about the nature of objects? In other words, why are these seen as objections to an ontology composed of objects? Everything that Adrian here says about objects are claims that I make about objects within the framework of onticology. Objects are dynamic processes, events, acts, temporally distended or elongated, changing, etc., etc., etc. We’ve been told time and again that our world is socially constructed, that we are bound to our particular place in the world and incapable of universality, and that we’ll never be capable of attaining knowledge of the world… But what if this wasn’t the end of the story? What if, after passing through and accepting the important critiques of universalism and truth, it was still possible to argue that we aren’t limited by finitude? Such a claim would be radical by the standards of most contemporary philosophy, yet a rising movement argues just that. This movement, loosely labeled as speculative realism, attempts to reject the morass and relativism of the postmodern era by arguing that the reality-in-itself (i.e. outside of its particular appearance to us) can be thought consistently. Beyond our finitude, beyond our situatedness, and beyond our particular perspectives, speculative realism marshals an array of logical arguments and empirical evidence to demonstrate that we are not inherently limited by language or conscious experience. It situates itself against the modesty of most analytic philosophy and the hesitancy of continental philosophy. Yet it also retains the clarity of analytic writing and the system-building of much of continental philosophy. It thus situates itself, not as a synthesis of analytic and continental philosophy, but rather as a third alternative – as a movement that increasingly finds itself at odds with both analytics and continentals. For object-oriented ontology– and here I think I can generalize among variants as diverse as my own position, Harman’s, and Bogost’s –the response to this passage is yes and no. With Nick we’re agreed that metaphysics is possible and that metaphysics is not to be centered on the analysis of the relation of humans to the world or the central gap between the human and the world. Nick’s characterization gets my dander up for three reasons. First, implicit in his remarks and his contrast between postmodern relativism and Speculative Realist metaphysics seems to be a distinction between culture and nature. Second, if I read Nick properly, he seems to be placing reality and being on the side of nature, and treating culture as other than reality. This would entail that it is the natural sciences that tell us what the real is. Finally, third, Nick seems to be claiming that SR, in all of its variants, is championing a correspondence theory of truth, where the thesis is that knowledge is a correspondence between thought and reality. The human-world pairing still remains at the center for Heidegger, who offers no resources at all (unlike Whitehead) for bringing object-object relations back into philosophy that do not involve humans as one of the terms. The usual tendency is to assume that the natural sciences are doing just fine with object-object relations, and hence that philosophy deals uniquely with human experience, which science supposedly cannot account for. But then cognitive science comes along and claims that even the human sphere can be treated scientifically, and everyone starts screaming “Yes!” and “No!” very excitedly at this program. But most of its shock value results merely from the initial stupid decision to treat human experience as the unique topic of philosophy. If like me you don’t even think the natural sciences give a good philosophical account of inanimate relations, then a scientific treatment of cognition is hardly going to feel any more threatening than a scientific treatment of fire. It will be no more adequate to one case than to the other. No model of a thing will ever grasp it. No knowledge of a thing will ever drain it to the dregs. No causal relation between two entities will ever allow them to make perfect contact; each entity always has depths unsounded by the other. To be is not the same as to have qualities discursively knowable by someone, not even if that someone is God. To know all the qualities of a tree (if that were even possible) would not turn us into the tree itself. 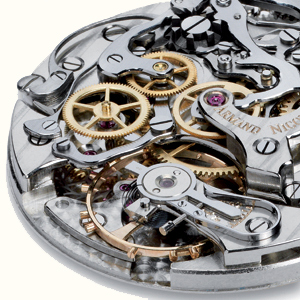 Another way of putting it would be this… We need a realism without a correspondence theory of truth. If you think that feeble human knowledge can adequately exhaust the inner life of things by doing nothing more than listing a few hundred measurable qualities, then your sense of reality is insufficiently robust. You are not interested in realism, but in celebrating the hard sciences and using them to beat up the softy poets who supposed ruled continental philosophy in the past. Reality is inherently something deeper than any relation that might be had to it. Aggressive neurology is no substitute for metaphysics. Q4: Your philosophy is ‘object-oriented’. That is to say that you consider the object to be as important as the (human) subject. Many people think this is dangerous, as activity in the blogosphere testifies. I think the issue here is that if the subject is considered as a mere object amongst others, people feel that humans might find it easier to justify abuse of other humans. What do you say to that? GH: Freud always claimed that psychoanalysis was the third affront to human dignity in modern times. Copernicus moved the earth out of the center of the universe. Darwin made us no more special than animals, plants, and fungi. And Freud made conscious thought derivative of less palatable underground currents in the psyche. As a fourth supposed affront to the dignity of humans, let’s add the notion to which you just referred: that the human is not metaphysically special either, so that my perception of fire is no different in kind from the relation of cotton and fire among themselves. Cognitive and causal relations all end up on the same footing. And it does seem to be a bit of a traumatic claim for people, judging by how upset they have become about it (I wasn’t expecting this to happen). I’ve heard the critiques to which you refer in your question, and just can’t make much sense of them. Some people have even claimed that object-oriented philosophy says that “humans are worthless.” I don’t get it. Did Copernicus say: “The earth is not the center of the universe, and therefore it is worthless”? Did Darwin say: “We are related to apes, and therefore we are worthless”? Why this all-or-nothing model, in which humans must be everything or nothing? There’s a lot of open ground between 0 and 100. To flip wildly between saying that humans are the best or the worst, just like political factions who flip between saying that the United States is either the greatest or most evil country on the planet, reminds me of one of the best-known symptoms of Borderline Personality Disorder.